My collection back in December 2017 was at nine watches. For the purposes of WIS, I don't include my Garmin, and my family's vintage pieces which can never depart are truly not mine, but rather I am caring for them for the next generation, as they say. The year ends with the re-establishment -for the moment- of the "treaty of six". The first real departure in 2018 was the Jaeger-LeCoultre Master Control Date. Even at 39mm, the scale against my small wrist due to the thin bezel and large dial was troubling. I think the original 37mm would have been ideal. I guess I tend to dislike change. While redeemed with lumed numerals and longer hands, the pumped scale from 36mm to 39mm had me questioning even at the time of last years SOTC. My eye demands it be 36mm. It's written into my fiber and cannot be undone. To a younger man, this might well be an ideal watch. Sadly, it was too ball00nish to my eye. I bought this for a beach trip and adorned it with a splendid C&B Premium NATO. We had a great time but sadly, I was shattered to have to return it for cause. It was such a wonderful watch, that even now I entertain trying it again. A sweet Bauhaus design from the late 1980s or perhaps early 1990s. Powered by an IWC 2210 quartz movement and with a wonderful silicon strap fitted with a titanium deployant. It was a lot of fun, but just a touch small. As thin as a few credit cars. Probably should have kept this one, but no regrets just yet. This was already a repeat player when it came back to me in 2017. It's a crazy great watch for the money, with an amazing dial and hands. But the intentionally thick case was impractical to me in the long run. I'll miss the layering and the cantilevered indices. A splendid winter watch. And now, "The IN CROWD"!!! So many "outs",.. so what's actually IN this SOTC??? Well, first, a few actually made it across an entire year without being sold or gifted away -- That's quite a feat in my collection! But I think when you see them, you'll understand how they pulled it off. While there were not many new additions this year, there were a few. This is a return player for me with a rather long history. This was my second "real watch" ever bought by me in 2008 as a black bezel watch. I had it a short while and sold it to my brother. For him, it was a serious stretch purchase and his concern for the investment led him to sock-drawer it for almost decade. I bought it back from him this year, sent it to the RSC for a cleaning and lubrication service and a Coke bezel. No polish whatsoever! :) . I'm happy to have a classic 5 digit Rolex back in my collection. I think I'd better keep it this time! I've wanted a B dial B-Uhr for ages and ages. One of my first TZ friendships started in reference to the Glashutte Original Navigator. With Laco's wonderful recreation now offered in so many sizes, I could no longer resist. For me, the Goldilocks was the Kempten at 39mm. A MAN & HIS WATCH and his... Giraffe! And appropriately, I'll proudly post the Haiku that brought me this treasure. This one was an impulse buy. A white dial. Fire blued hands. Hand wound. At least at the time, irresistible to me. I wasn't sure whether to include this, as it's somewhere between Italy and my watch box. But I'll be optimistic. Besides, with just two adds this year, I'm looking for bonus points so don't get kicked out of the club. And so the year ends with myself in that brief satisfaction state. I wish you all the very best in the new year my TZ friends! Nice all around. Ins and Outs. You had an active year. Wear them in good health and may 2019 bring you more. Pity about the JLC, but if it isn't right then it has to go. The two rectangular vintage pieces look great. What are they? They are my Father's Elgin and my Grandfather's Girard-Perregaux. Sadly I had some work done on them when I was younger. Most regrettably I had the dial redone on the GP. The early mistakes of a younger WIS. I'm very grateful to have them. I'm all in with your new additions. Wow! I like these two the most. Thanks.Naturally others are terrific, too. Great stuff all around but as I say every time you post a picture of it, I simply can't get over how much I love that breitling. It's just plain spectacular. Happy New Year as well ! ....... are you upto something to shake up the collection or just a perpetual feelings to change ? Anyway do keep the Breitling and the Seiko SLA. The coke is very intriguing. The Breitling is cool too. 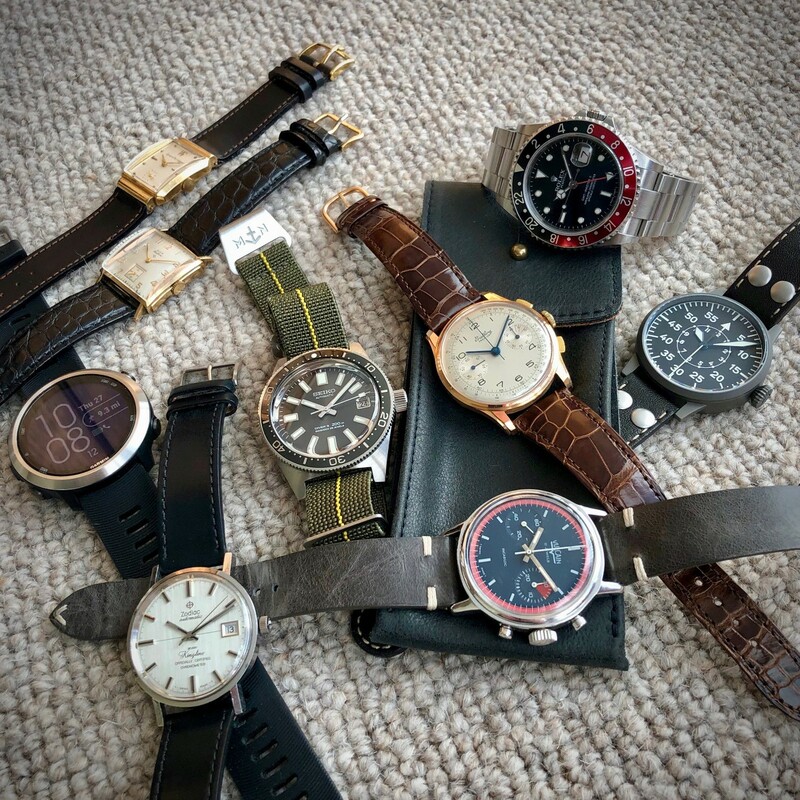 That Breitling might be my favourite of the bunch. Hope it sticks around for your next SOTC! I never purchased any Rolex, but both of yours look very tempting. Sad to see the Explorer go, but the New Coke looks awesome on your wrist. ...with a favourite being the exceptionally nice Zodiac Kingline. Mention your Garmin Forerunner 645! Just had a quick question, do you know the case diameter for the zodiac kingline of yours? I am not sure if there are two sizes, some say its 33mm and some say its 35.
well selected collection. have fun with it. Beautiful and unique sets of Dials. Next Topic: Guess the brand/maker (just for fun, no animals involved).